A rare tape featuring The Beatles joking during a 1964 recording session is to be auctioned. 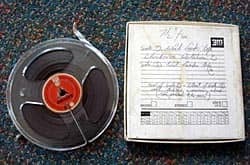 The 30 minute reel-to-reel tape was recently discovered in a loft, where it remained for more than 40 years. It most likely dates from 18 October 1964, the day the group recorded I'll Follow The Sun at Abbey Road Studios. The song was first released on the Beatles For Sale album in December that year. The tape also includes other Beatles hits and a number of cover versions. It will go under the hammer at Cameo Auctioneers in Midgham, Berkshire in August, with an estimate of £8,000 to £12,000. Along with I'll Follow The Sun, the tape includes versions of Don't Put Me Down Like This, I Feel Fine, She's A Woman, Everybody's Trying To Be My Baby, Honey Don't, I'm A Loser, Too Much Monkey Business, Nitty Gritty, Something's Gotta Hold Of Me and I Shall Not Be Moved. Lennon: I'm playing baby. I know I can't stop laughing because I can see them two. I'm not looking at you. Lennon: It's just going to get funnier and funnier as the evening goes on. It's 11 o'clock, you know. McCartney: Let's just try this once more and if it's the last one that's hard lines. The pair then attempt I'll Follow The Sun a number of times before collapsing in a fit of laughter. The vendor lives up north and was clearing up his father's loft when he discovered it. His father is still alive and worked in the music industry. When you listen to the recording it makes your skin tingle because it's from a period of time when the Beatles were still friends, it's early Beatles. You can hear John, Paul and Ringo having a joke and a laugh together. They are laughing because they can't get a song right. It's a real collectors piece. We are expecting a lot of interest in it worldwide.